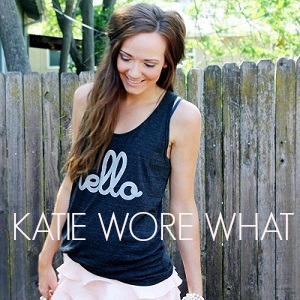 Katie Michelle Reyes’ blog Katie Did What has drawn attention for her self-described “California chic” looks and fun, effortlessly bubbly voice. It’s all in a day’s work for the freelance writer, who resides in Sacramento with her husband, Zack. Their family is about to welcome a third member, as Katie is pregnant with their first child, a boy who’s expected to arrive just about a month from now. Adapting a stylish lifestyle to a baby bump hasn’t been easy, but Katie’s managed to pull it off– and has even found some outfits she can still wear once the baby arrives. “I’ve pretty much steered clear of the maternity section for my entire pregnancy, except for investing in a good pair of maternity leggings (a necessity!) and a few dresses. All it takes is some patience and creativity, and you can absolutely stay fashionable and keep your style throughout your pregnancy.” To help decode the mysteries of dressing for two, Katie came up with a couple of maternity outfits that will make soon-to-be moms feel like rockstars– and a post-baby outfit to wear on that first night back out on the town. A casual day at home: When it comes to everyday maternity wear, Katie is a big advocate of the maxi dress. 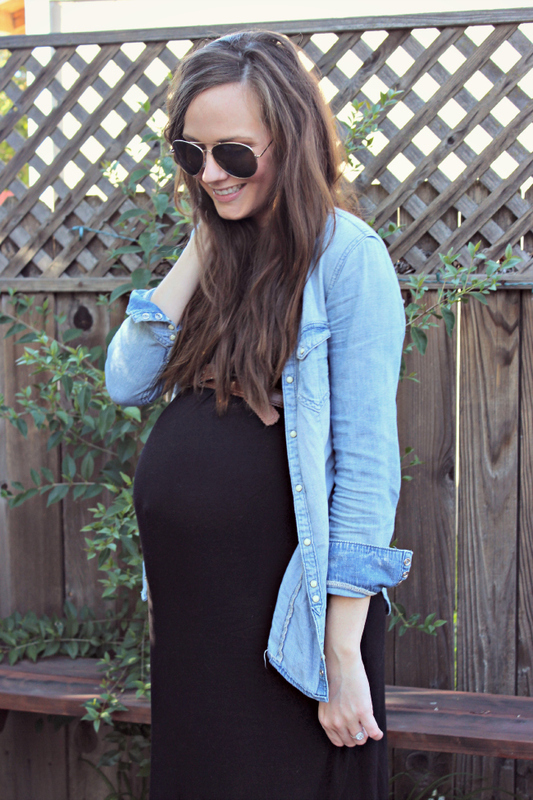 “They’re both flattering and super comfortable, which are two things that are very important when you’re pregnant!” She digs this casual black Ann Taylor maxi, which gets accents of laid-back cool from the addition of a Levi’s chambray top, flat gold Dolce Vita sandals, and Ray-Ban aviators. For a slightly more dressed-up occasion (or chillier temperatures), she’d switch out the chambray for this cable-knit pink Gap maternity sweater, which makes the look a little softer and more feminine. And for moms-to-be who are feeling especially bold, she suggests accenting the dress with a simple brown Loft belt right above the top of the bump, to show it off. For a baby shower: Katie just had her own shower this weekend, and as she’s the first to admit, “I’ve got baby showers on the brain– well, let’s be honest, I’ve got babies on the brain, period!” For women who are about to become the guest of honor at a shower of their own, she recommends a loose, flowy dress with an empire waist, like this cheerful pink one from J. Crew or a ’50s-inspired emerald dress from French Connection, as a dressed-up, but still comfortable, option. Trendy Sam Edelman ankle boots are nice and flat, ensuring overworked feet stay comfy, while a flower crown adds a celebratory, bohemian touch. First post-baby date night: While Katie can’t wait to meet her son, she knows she and Zack are going to need some solo date time to make up for the long nights of feedings and diaper changes ahead. So she chose an outfit that’s fun enough for a grown-up night out, but still adaptable to the realities of post-baby weight loss. “This flowy ASOS dress is glamorous, but still figure-flattering,” she says. “And I’ll finally be able to walk comfortably in heels again, which is an excuse to pick up this versatile Nine West pair.” A mirrored Natasha Couture box clutch completes the fun, yet still relatively covered-up look. Have a favorite fashionista you’d like to see browsing thredUP? Let us know in the comments, and we’ll add them to our list of stylish recruits.